Tell us a little about yourself. Jesus Is Sovereign Lord! To Yahweh The Lord God almighty be Eternal Glory Honor Praise! Christian Save by Grace through Faith in Christ Jesus The Lord! I bless and thank Him for the Grace of Authorship, in lifting up a Living Memorial unto Him Who is Worthy, absolutely deserves the Praise...! Grace of authorship to share His Excellent Greatness and Mighty Glorious Acts..., even in this 21st Century, as ever; to wit that He alone is God..., The Same as ever; able to save, heal, deliver..., transform..., do all things according to His Will. What was your motivation behind this project? Praise be unto the Lord God Almighty! 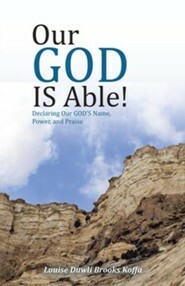 I was divinely inspired to write this book, sometime after going through many tsunami-like challenges in life, in which I was crushed, broken, burdened, threatened, hurt, and the like...; most especially after experiencing His Power of Resurrection, that same Power Who raised our Lord and Savior...' quickened and restored my husband..., after that experience in the Intensive Care (ICU), I felt led to testify of HIs life transforming power, capacity, supernatural ability; declaring His Name Power and Praise, for He is well Able to do all things most excellently far above and beyond all human limited capacities, understandings. What do you hope folks will gain from this project? Through the Spirit of Grace and Glory, this is intended to motivate, inspire, strengthen, encourage..., those going through unforeseen challenges, traumatic life experiences, as well as others, that God is Able! Truly, it is not over until God says it is over, He has the final say; no matter what life brings..., stay in the Word, keep standing, stay strong in the Lord and in the power of HIs might..., take advantage of all the supports, only believe all things are possible through Him, just dare to trust Him with all your heart, lean not to your own understanding, acknowledge Him always, He will direct your paths. You see, Scriptures tell us God loves us all..., He loves you precious heart, He has you in everlasting remembrance, He will never leave nor forsake you, the covenant of His peace is with you. I Love you, remain blessed in His Holy Name! How were you personally impacted by working on this project? To say the truth I have never been a writer, teachers/professors will confirm this, I struggled and still struggle with composing things, and have to do it again and again.... So having heard in my spirit to write this Book, I remember saying (of course like others including some of those mighty men and women of God who gave excuses), I cannot even construct a sentence, or even a phrase ..., how can I write a book. But was Holy Spirit inspired, through Him I kept trying..., from 2001 -2016 -the book finally came out. 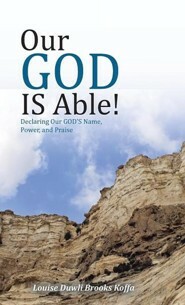 That's why I speak of 'Grace of Authorship;' certainly this is all God's doing..., marvelously marvelous...! Alleluia! Praise The Lord! Amen and Amen! Who are your influences, sources of inspiration or favorite authors / artists? It is all written in the Book. first and foremost The Spirit of Christ, He is my source of life, inspiration, motivation, strength, longevity, Al and All And All; apart from Him I am completely undone, extinct, it is by with and through His Grace and Mercy I am and have. To Him be all the Glory! My darling precious mother was God-fearing, very loving, nurturing, inspirational, and then my aunt -second mother, and many others the Lord inspired in various stages of life, to be a blessing to me. Anything else you'd like readers / listeners to know: Praise the Lord for HIs Grace and Mercy; for the Grace of authorship, we sacrifice the sacrifice for praise and thanksgiving unto Him. This is certainly a blessing, thanks so very much for the opportunity to share in this manner; we will be available to share/present in other ways, and can be contacted through our contact information. We are greatly joyful in the Lord, thanking Him for establishing the work of our hand/s for us, excited about the exploits He is doing through The Body of Christ, through this great organization, manifesting His Kingdom in the earth, according to His Will, for His namesake and Glory. This book is must read, real life experiences, real people, non-fiction, it is very inspirational, empowering, biblically rooted; we pray it is a blessing to you and yours; get a copy or gift copies to others; and remember it is not over until He says so; the Lord bless you real good! It is our prayer to expand this work, increase publication, sales; movies, audio...; thank you for your prayers, and support in whatever way the Lord is leading.